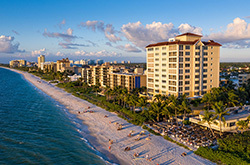 The Vanderbilt Beach Resort is an intimate family-owned Naples beachfront hotel. Our atmosphere is relaxed, casual, and reminiscent of the small hotels of Olde Florida without sacrificing the modern amenities that you have come to expect. This off-the-beaten-path hotel is cherished by travelers who value an authentic Florida vacation experience and gracious hospitality. But be careful! Our hospitality is contagious. Many guests return every year for a fresh dose of relaxation and Olde Florida-style hospitality. You may even make lifelong friends with our staff or other guests. So step away from the stressful everyday world and join us for a relaxed and unique beachfront vacation on the sands of the Gulf of Mexico in sunny Naples, Florida. Three Generations Of Gracious Hospitality! Naples has changed since 1968 as it has become a well-known travel destination. But our hotel’s philosophy has remained the same: to allow our guests to relax and recharge, to encourage our quietly friendly staff to get to know our guests in order to serve them better, and to give our guests the opportunity to get to know one another. We believe in extending gracious hospitality to all of our guests, and as a result, many of our guests choose to return year after year. In a busy world filled with indistinguishable chain hotels and impersonal service, the Vanderbilt Beach Resort remains an oasis of relaxation, and our property reflects our laid back atmosphere. Our lobby is intimate, and all of our rooms open directly to the outdoors so that guests can relax on their porch and enjoy the view or go to and from the beach without having to walk through closed corridors or a fancy lobby. Our rooms are some of the closest to the beach in Naples, which makes it easy to enjoy the beach during the day and our beautiful sunsets at the end of the day. Once you check into the hotel, you choose whether you see our staff again. Your room is your own, and you can come and go as you please without having to walk past the front desk. All of our rooms have a full-size refrigerator, microwave, cooktop, glasses and utensils so that you can make yourself at home. But if you do want to dine out, the best beachfront restaurant in Naples, the Turtle Club, is only steps away, right on our property, and offers fine casual dining on the beach. The Resort has retained the charm of the Olde Florida of the past -- laid back, unassuming and relaxed – but it belongs squarely in the Florida of today with amenities like wireless internet, fine dining, beach chair and umbrella services, and world class shopping and dining only minutes away. Top it off with courteous friendly service, and you end up with a truly one of a kind resort that everyone can enjoy. From hotel rooms to condominiums, we offer a variety of unique room styles for your beach vacation. Beachfront Hotel Rooms. Our two-story beachfront hotel building offers traditional hotel rooms as well as junior suites with a separated bedroom and small living room. All of these hotel rooms feature a full-size refrigerator, microwave, cooktop and coffee maker, as well as other amenities and conveniences. These rooms have an angled view towards the beach and the Gulf of Mexico and are a very brief walk from the beach. Condominiums. Our four-story resort condominium building offers two-bedroom, two-bath bayside condominium units with more space so that you may relax. These units boast a full living room, full kitchen, dining room, screened lanai, and a washer and dryer in the unit. The screened lanai overlooks beautiful Vanderbilt Lagoon, and the condominiums are directly across the street from our beautiful beach and only a minute’s walk to the sand. Whether you plan to stay with us for only a few nights or whether you extend your stay to several weeks, we have the accommodations to suit your needs. Located in our beachfront hotel building, these rooms feature two extra-long, plush firm double beds, a 32-inch flat screen TV with Direct TV service, free WiFi, a full-size refrigerator, a microwave, cooktop, and a coffee maker. Several of these rooms are located on the ground floor and they offer views of our orchid garden. A Gulfside Studio sleeps up to 4 persons. Located in our beachfront hotel building, these rooms feature two extra-long, plush firm double beds, a 32-inch flat screen TV with Direct TV service, free WiFi, a full-size refrigerator, a microwave, cooktop and a coffee maker. These rooms have an angled view of the Gulf of Mexico from within the room and an outdoor patio that is perfect for enjoying the sunset each evening. A Beachview Studio sleeps up to 4 persons. Located in our beachfront hotel building, these rooms feature a living room with two Bahama-style twin beds that serve as couches during the day and a bedroom separated by plantation shutters with a queen-size, plush firm mattress. These rooms also include a 32-inch flat screen TV with Direct TV service, free WiFi, a full-size refrigerator, a microwave, cooktop and a coffee maker. These rooms have an angled view of the Gulf of Mexico from within the room and an outdoor patio on which you can sit and enjoy a good book or a frosty beverage at the end of the day. A Beachview Junior Suite sleeps up to 4 persons. Located in our beachfront hotel building, these rooms feature a living room with two Bahama-style twin beds that serve as couches during the day and a bedroom separated by plantation shutters with a queen-size, plush firm mattress. These rooms also include a 32-inch flat screen TV with Direct TV service, free WiFi, a full-size refrigerator, a microwave, cooktop and a coffee maker. These rooms boast a view of our garden courtyard and swimming pool, and most have an outdoor patio on which you can sit and enjoy a good book or a frosty beverage at the end of the day. You can see the beach at an angle from the outdoor patio, but the view is not as direct as the view from the Beachview Junior Suites. 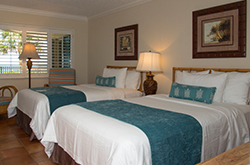 A Gulfside Junior Suite sleeps up to 4 persons. Located in our beachfront hotel building, this room is one of a kind. You can't get much closer to the Gulf of Mexico than this. This 500 square foot, one bedroom suite directly overlooks the Gulf of Mexico. It has a separate bedroom with one plush firm queen-size bed and a living area with two Bahama-style twin beds that double as couches during the day. This room also include a 32-inch flat screen TV with Direct TV service, free WiFi, a full-size refrigerator, a microwave, cooktop and a coffee maker. This room boasts a large outdoor patio where you can sit and watch the beach during the day and where you will have an excellent view of the sunset each evening. Our Beachview Deluxe Junior Suite sleeps up to 4 persons. Located in our bayside condominium resort building, these standard resort condominiums are spacious two-bedroom, two-bathroom units. Each room has a plush firm king-size bed in the master bedroom and two plush firm twin beds in the guest bedroom. Each condominium also boasts a large dining room/living room area and a large, fully-equipped, eat-in kitchen including a full-size refrigerator with ice maker, stove and oven, disposal, dishwasher & microwave. Each standard condominium also includes a washer & dryer, flat screen TV with Direct TV service, and free wireless internet access. The screened lanai with table and chairs overlooks lovely Vanderbilt Lagoon and is perfect for an evening meal or cocktail. This condominium sleeps up to 6 persons. Located in our bayside condominium resort building, these deluxe resort condominiums are spacious two-bedroom, two-bathroom units. Each room has a plush firm king-size bed in the master bedroom and two plush firm twin beds in the guest bedroom. Each condominium also boasts a large dining room/living room area and a large, fully-equipped, eat-in kitchen including a full-size refrigerator with ice maker, stove and oven, disposal, dishwasher & microwave. Each deluxe condominium also include a washer & dryer, a flat screen TV with Direct TV service, and free wireless internet access. The screened lanai with table and chairs overlooks lovely Vanderbilt Lagoon and is perfect for an evening meal or cocktail. This condominium sleeps up to 6 persons. Small Naples Florida Beach Hotel With Big Amenities! Experience our unique amenities that enhance our beachfront location. Vanderbilt Beach stretches approximately five miles along the Gulf of Mexico from Clam Pass to Wiggins Pass. Stroll along the beach, swim or snorkel in the Gulf's gentle waters, sunbathe on the beach, or fish for local snook that school just offshore in the summer. However you choose to enjoy it, the beach is a never ending delight. Our beach attendants will help you relax with full beach service, including beach towels, beach chairs, umbrellas, drink tables and drink service on the beach. You may even want to try your hand at our"Ringmaster" Bimini Ring Game to see if you can join the hall of fame. We are one of the best Stand Up Paddleboard destinations in the country! We offer PAU HANA paddleboards for rent right at the hotel so that you can enjoy this new sport and cruise the Gulf with the dolphins or ride its gentle waves. Moreover, we are the only location in Naples where you can rent WAVEJET paddle boards, which include a jet propulsion system on the bottom of the board that allows you to travel at up to 7 mph without even paddling! It is silent, fast and a ton of fun. We can also help you book fishing charters, sailing trips or other water excursions with our water sports business partners. Our beachside hospitality is second to none! Our heated swimming pool, situated right next to the beach, is a hit with kids and adults alike. Curl up with a favorite novel in a lounge chair by the pool. In the winter, the pool offers a balmy alternative to the sometimes cooler, winter Gulf temperatures. We have several cruiser bikes that we offer our guests free of charge. Explore the Vanderbilt Beach or Pelican Bay areas by bike, or take a day trip to the beaches at Wiggins Pass State Park, Clam Pass Park, or Barefoot Beach in Bonita Springs. Don't miss our award winning Turtle Club Restaurant for a sunset cocktail, relaxed lunch in the sand, or the casual fine dining coastal cuisine that has made the restaurant famous with both locals and visitors alike. If you need to check e-mail or (gasp!) do some work on your laptop during your stay with us, you may use our free wireless internet to surf the web to your heart's content. Forgot to bring your computer? No problem - our iMac is available in the front office for our guests to stay in touch with the world or print boarding passes. We also offer free daily newspaper service if you want to reconnect with what's going on in the world. Stop in our front office to pick up your paper in the morning, enjoy a complimentary cup of coffee and a pastry and chat with our staff about the weather. No worries here! Coming to the Resort by boat? No problem. We are one of the few properties in Naples that has its own boat docks. These docks are available on a first-come, first-served basis for our guests who want to take advantage of Naples phenomenal boating conditions by bringing their own boat. Our tennis/pickleball court has the best view in town! Learn to play pickleball, the newest racquet sport craze, on our court that overlooks Vanderbilt Lagoon.